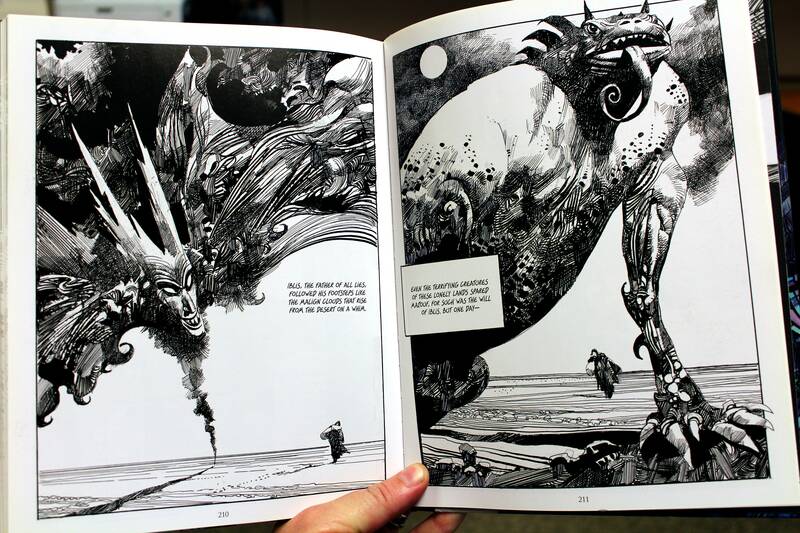 So minutes after cracking open and flipping through my edition of Sergio Toppi’s Sharazde: Tales from the Arabian Nights, I had placed an order for a second copy—this one to ship to Europe where my father lives. I didn’t want him to see scans of Toppi’s work online. I didn’t want to message him photographs of these drawings. No, he needed to behold this gorgeous collection of art in person and I would not wait for him and my mother to fly out to visit in the summer. I needed to share this now. Or as close to now as shipping to Europe could approximate. And I wasn’t disappointed. His reaction very much mirrored my own. He was just as blown away and gob-smacked as I was. Being a genuine surfer hippie from the genuine surfer hippie days, the word “stoked” might have held some play as well. There was joy, there was adulation, and there was awe. 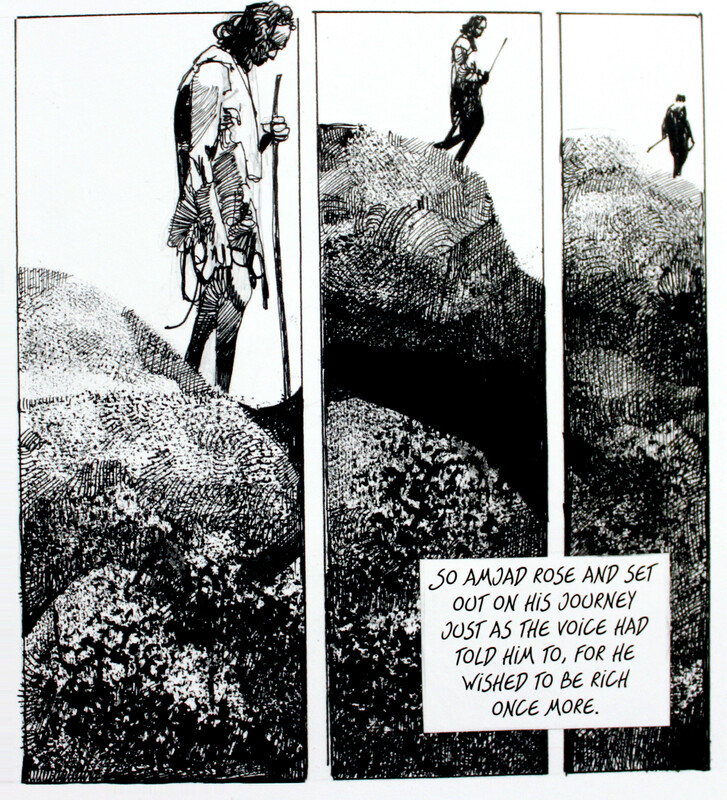 In short, Toppi’s work received from my father (and from myself) exactly the reaction his work deserves. 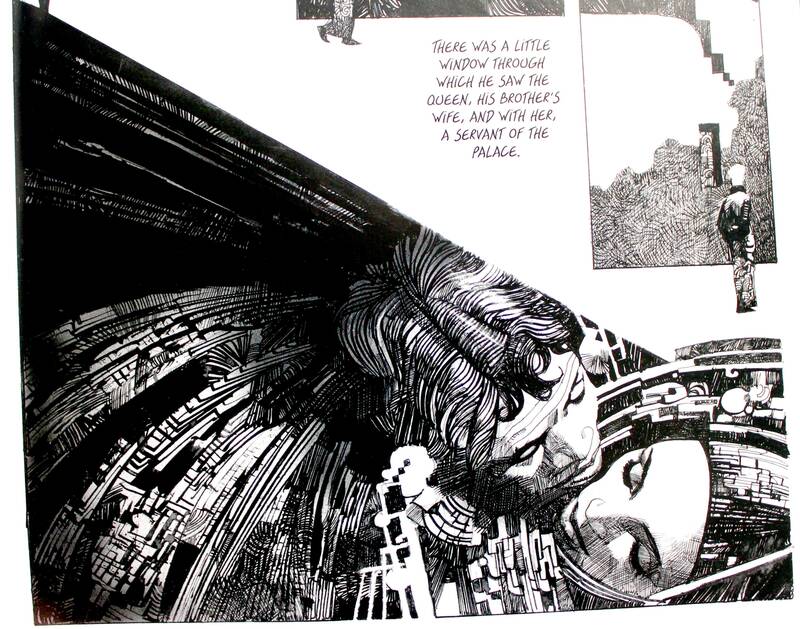 I’ve been describing Sharaz-De in terms of its art and even think of it primarily as an art book—something to display for guests—rather than as a comic book or graphic novel. 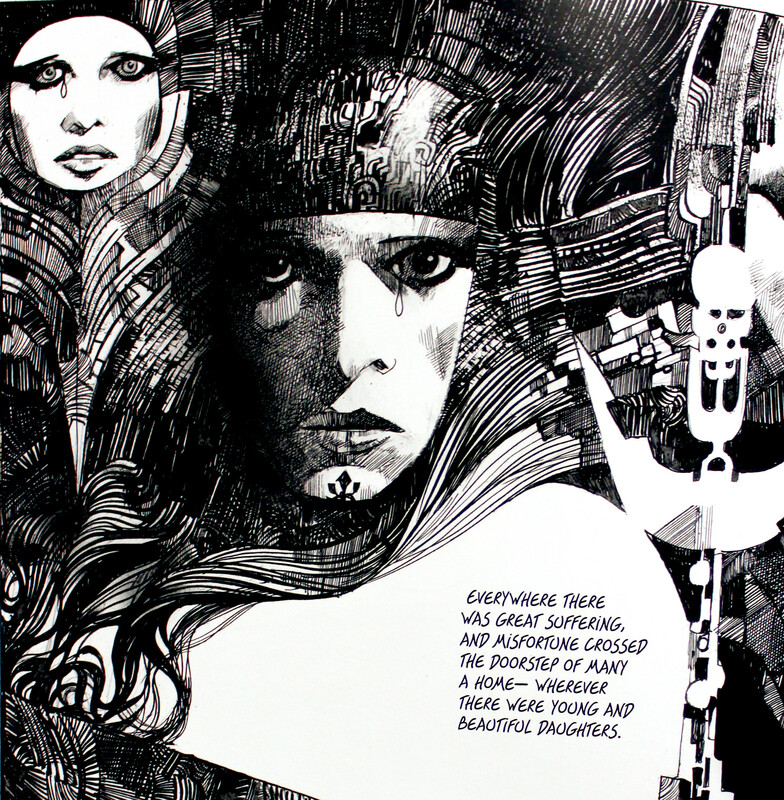 It has a story and it has writing, but those things really seem mostly in place to provoke Toppi to draw something interesting and amazing and earth-shatteringly beautiful. Honestly, I may never read the book’s story ever again. And that’s fine and I don’t mind. I certainly don’t feel slighted. This is an amazing book and worth every penny I spent on it. Part of my ambivalence toward the book’s narrative aspect may be that it’s an adaptation of a kind of literature I generally avoid: the fable. 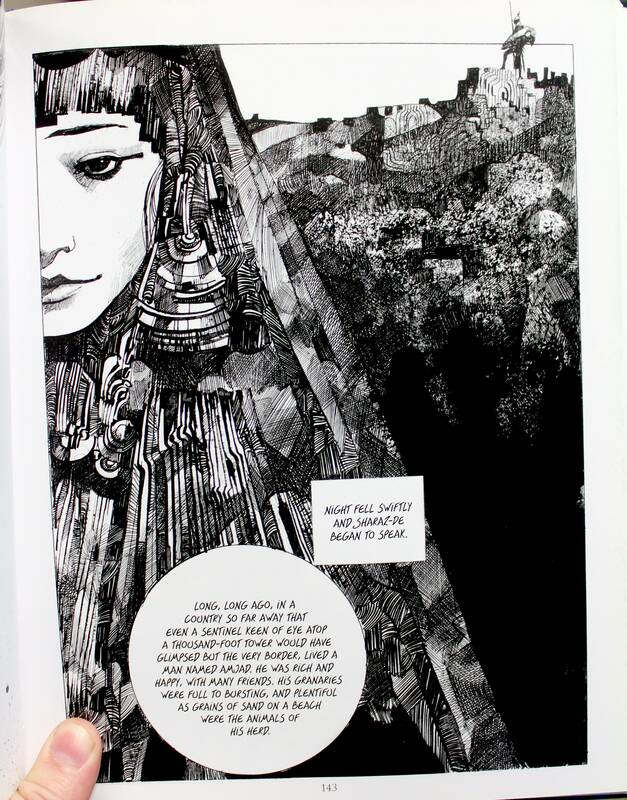 Toppi is adapting some of the stories of Scheherazade, the ken of which have long filtered into our societal consciousness. Even if one is unfamiliar with the tales of the Arabian nights, the structure and morals are ubiquitous. Characters who are dishonest, ungrateful, and oath-breakers meet untimely and often terrible ends. If you make a promise to a strange being who gives you wonderful fortune with a single stipulation, whatever you do, don’t blow it where that stipulation is concerned. These fables are common across cultures—so if you’ve read European or Asian fables, you know the drill as well. Just desserts figure prominently. 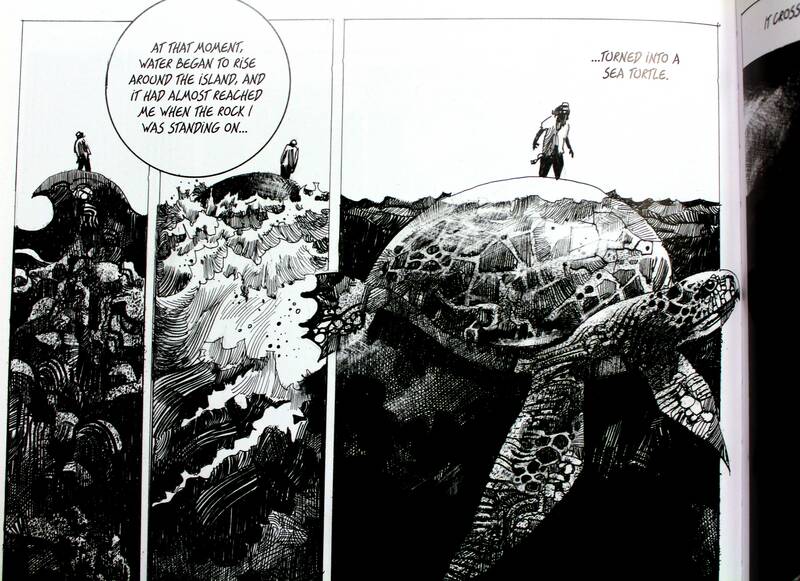 Toppi doesn’t do any astounding narrative acrobatics with these fables. They are told in rather straightforward tone. They are there and they are faithful and not much more. But as I said, when they were the genesis for such wild visual imaginations, it really stops mattering how faithful the narrative adaptation is. I’ve included some photos of the art, but please don’t imagine these do anything near to approximating what you’ll see in Sharaz-De. It’d be like a guy carrying a faxed photo of his girlfriend in his wallet. 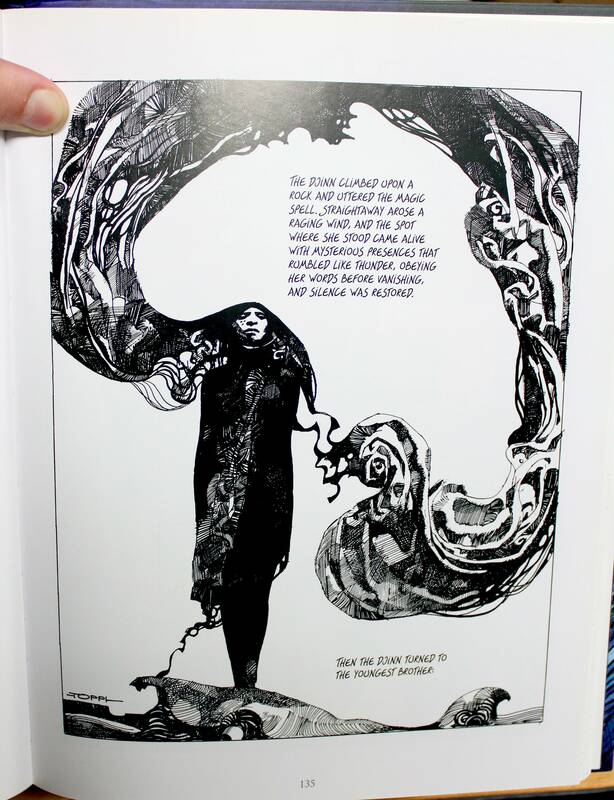 These pics are merely sad facsimiles of the crisp printing that inhabits the paperscape of Archaia’s lush, large book.